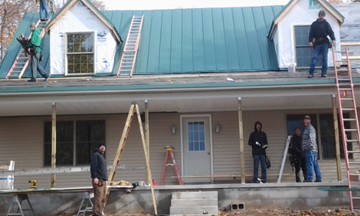 D&T Roofing & Siding installed shingles, eaves, soffits, decking and railings on our home. I found them responsive, competitive and workmanship was excellent. Dana and Casey are knowledgeable in their trade and provide excellent advice in the selection of materials used for the work. 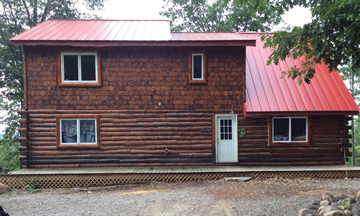 Working with D&T has been a pleasant experience and I recommend them for consideration for carpentry, roofing, and siding projects." We wanted to thank you for a great job on our restoration, and re-modeling project. D&T Construction was a pleasure to work with. The project planning, documentation, reutilization of existing materials, and quality of workmanship was extraordinary! The construction was on time, on budget and the communications you brought to our project, was outstanding. It’s always a comfort to know the job was done right. The end result shows the care your employees took to complete each phase of the project. Thank you for making our dream a reality. We will continue to recommend your company to others without reservation. Please share this letter with your fellow employee’s to let them know how much we appreciate the craftsmanship they provided. Thank you D&T for sponsoring our family during this holiday season. May many blessings come your way. God bless you! Merry Christmas & Happy New Year. Professional construction services from small to large projects. Weather it’s a family house or a large building we’ll take care of it. Interior design services including all indoors work, from electricity, floor construction and decoration, wall decoration, pluming, etc. Providing professional construction services since 1972.